Creating your e-book requires software. You need to plan out your project, then write it. Next, you need to format everything to give it a polished look and add a virtual cover. Finally, you need to convert the whole thing into a PDF document for distribution. You could spend a lot of money buying the software needed to do all the work you need to get done. But, fortunately, there are plenty of free resources out there to help you get the job done. Bubbl.us - Online mind mapping tool that allows multi-user collaboration. OpenOffice - This free office suite includes word processor, spreadsheet, database, drawing, and slideshow programs. Google Docs - This full office suite is completely online, so you don't need to download any software. GIMP - GIMP is a full featured image creation and editing software package. Splashup - Full featured online image editing tool. OpenOffice - One of the great things about this free office suite is that it has a built-in PDF conversion tool. Free PDF Convert - Another free online PDF converter that converts many document types to PDF. Do you have a favorite free resource you love to use when creating your e-books? Share it by leaving a comment below. There are innumerable ways to use E-Books to promote your business and drive quality traffic to your website. Once posted on your site, you can turn them into a daily course, which brings your customer back to read the next chapter. You can use them as a free gift for making a purchase or for filling out a survey. Put your E-Book on a disc, and you will have an innovative brochure. Blow your competition away by inserting the disc into your sales packages. The most effective marketing products are those that are unique. Copyright your E-Book, and immediately, you have a powerful tool that you, and you alone, can offer to the public. People will have to visit your site to acquire your E-Book, which increases the flow of quality traffic and the potential of sales and affiliate contacts. Make sure that you keep your E-Book current. Update it frequently as the market and trends change. Add new advice and techniques to show your prospects how your goods or services can enrich their lives. By constantly keeping abreast of new trends and techniques, you can continue to see profits from your E-Book for years after your original creation. Another phenomenal advantage of E-Books is that you can test their marketing potential without putting out hardly any cash at all. You can even produce an E-Book one copy at a time, each time you receive an order, eliminating the need for storage and inventory. By this method, you can gauge the salability of your E-Book, and make adjustments as necessary until the orders start pouring in. E-Books allow you to learn about your market and customer habits and motivation over a period of time, without risking your precious financial resources. They also provide you with an invaluable way to gather marketing information, which you can use in many different facets of your business. Use your E-Book to discover what the specific goals and problems are in your specific industry. Then figure out how to solve these problems, and publish an E-Book with this invaluable information. This will increase the value of your business, upgrade your reputation, and get you known as an expert in your field. You can extend the value of single E-Book by breaking the book down into chapters for a serial course, into special reports available on your website, or into audio or visual tapes. E-Books can be broken down into several different promotional materials by accepting some of the articles and using them to promote your product. You can include a catalog in your E-Book to promote all the products or services you sell. You can include a thank-you note for reading your book and an invitation to download a trial version of your product. Or you can include a form for your audience to contact you for further information or with questions, thereby building your business relationships and your mailing list. Using E-Books in this manner helps to cut the cost of individually producing separate promotional materials. You can use a single E-Book to entice new prospects and to sell new products to your current customers. No other medium has this kind of flexibility and ability for expansion. Think of your E-Book like a spider spinning a beautiful and intricate web. Now go and create that web, and see how many customers and prospects you can catch! When it comes to creating profitable ebooks, speed is your friend. Why, because the moment you start slowing down in your ebook creation process you begin to lose momentum. Then, distractions start to appear and you lose your excitement for the project. ...Get the E-book Template 12-Pack Now! One of the most powerful aspects of marketing on the Internet is that this form of communication removes nearly all of the friction involved in getting others to spread your message. If the message is compelling, it is as simple as hitting the forward button in your email software for your readers to share it with others. Blogs, RSS feeds, tell-a-friend scripts, download directories, Facebook pages, Squidoo Lenses, MySpace pages, bookmarking sites, and dozens of other resources make it easy to spread your message. 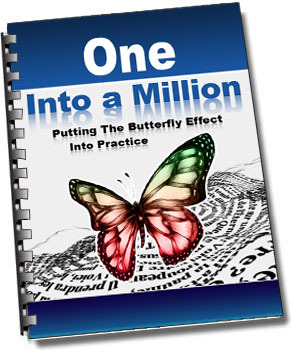 "One Into A Million" is a special report that will show you how to leverage the Internet to create powerful marketing promotions.